This blog by IHE Policy and Public Affairs Manager, Joy Elliott-Bowman, was first published on on the Wonkhe website. Just a few weeks ago, before the drama of Brexit began to unfold, HESA released its “Experimental Statistical First Release (SFR)” of Undergraduate Designated Courses at Alternative Providers. Collected in collaboration with BIS and HEFCE, the data covers 63 of the largest HE providers outside of publicly funded universities and colleges. This group is the first round of providers to submit HESA returns, and there is a long-term plan for more privately funded HE providers to submit data in the future. The report is an important start to integrating data from providers across the spectrum. While the data may not be perfect, it is still welcome for the opportunities and insight it gives us into a relatively less well known sector. Many myths abound about the purpose and make-up of new higher education providers, and more data can only help all of us to have a more honest understanding of how they compare to traditional universities. The data released is mostly from larger providers of higher education, and 40% of the students sampled were undertaking HND or HNC courses. The sample includes private universities such as BPP, Regents University, and the University of Law; their students make up 16% of the entire sample. The Greenwich School of Management (GSM) is the largest institution within the dataset, representing 14% of the entire student population included. There are probably considerable differences between these institutions and smaller and more specialist institutions not included in the dataset. A common funding model is the only characteristic that unites these very different types of providers, and so it will be important not to make a ‘category error’ in the future by considering the autonomous sector homogeneously. There are a number of significant challenges for making sense of the data published, not least of which being that the sample includes only 63 of an approximately 700 alternative providers currently operating across the sector. It is thus very important that advocates and critics of expanding alternative higher education take considerable care when trying to find evidence to back up their positions. The data does show that alternative providers already play an important role in widening participation. The student population is mature, with 43% of all students aged 30 and over and only 23% under 20 at enrolment. Alternative providers educate a significant number of BME students with 34% identifying as black and 19% as Asian, compared to publicly funded providers where black and Asian students are each 10% of the overall student population. Looking beyond the most popular subjects, students studying more specialist programmes are particularly diverse, with high numbers of BME students in computer science, creative subjects, and social studies. Black and Asian students in computer science outnumber white students by 3 to 1. Widening participation data in this small sample is further supported by a BIS reportreleased in May, which surveyed students and institutions at 276 alternative providers back in 2014. The data showed that 51% of students were over 25 and 48% were from a “non-white background.” Staff at alternative providers are already very aware of the role they play in widening participation in higher education. 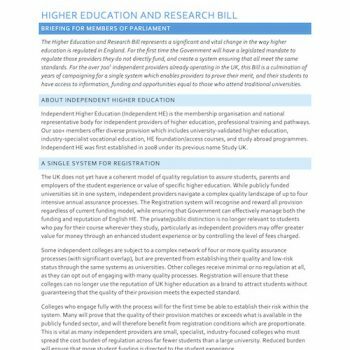 Many independent colleges have tailored their provision to meet the needs of widening participation groups through creating flexible entry models, more teaching intensive courses and smaller class sizes. Independent colleges are also less likely to deliver a strict three-year level 6 model taught in traditional universities, and instead blend levels 3-6 together in a range of programmes designed to attract those who would not meet the admissions requirements of established institutions. The majority of students in independent providers study business, though this particular dataset does include a significant amount of specialist business providers. 66% of the students in the sample are from just twelve institutions, and all but two are large colleges or universities focused on business and management subjects. 21% of the students in the sample come from just two providers, BPP University and GSM. Given the limitations of this data, it is too early to make any comprehensive conclusions about the subjects offered across the alternative sector. There are many colleges specialising in technology, creative subjects, and theology are not covered by this data, though they will likely be included in future releases over the next two years. The data shows that students in alternative providers are primarily studying HNC/HND or similar courses. Looking more closely at the providers included in the sample shows that alternative providers are offering models which allow students to progress through qualifications such as HNC/HND before being admitted to a first degree course. The popularity of HNC/HND level study is indicative of the demand for a flexible delivery model, and less an indication of the level of qualification students aspire to finally achieve. The prevalence of flexible models suggests there are likely to be more students who have not been captured by the data. Many students at alternative providers choose pathway courses, with providers such as GSM offering a foundation ‘year zero’ as standard with most of their programmes. The aim of the ‘year zero’ is to support students without the UCAS tariff necessary for direct entry to university to progress onto full degree level study. If the HESA definition of a higher education student remains as it is now, many of these students may never be measured in the data. These students, along with many on professional short courses or following highly flexible blended learning models are not submitted as part of the HESA return. The challenges in finding a common model for counting these students alongside ‘tradition’ HE students in data is substantial. The impact could be significant if the all-important UK Performance Indicators are based on only a fraction of the students taught at alternative providers. The many differences between this most recent release and the BIS report from May would suggest that our larger challenge may not be how to interpret the data we have, but simply to work out who to count in the first place.